A group of nongovernmental organizations from Southeast Asia recently teamed up to urge China to immediately halt its construction of a hydroelectric dam in Cambodia -- another case of local opposition to China's overseas energy investments. The project is set to be built in Cambodia's Stung Treng province with a production capacity of 400 megawatts. Known as the Lower Sesan II Dam, it is scheduled to launch resettlement and construction work this year, with clearing for the dam's 130-square-mile reservoir already underway. "Communities are reporting problems at the dam site which raise questions about legal compliance, such as logging outside of the reservoir area, unlawful fishing activities, use of child labour and deteriorating water quality downstream," Meach Mean, coordinator of the 3S Rivers Protection Network, said in a press release. "Proceeding without properly identifying and addressing damage in Cambodia as well as in Vietnam, Laos and Thailand, may carry reputational risks for the companies and dire consequences for ecosystems and communities, and could even threaten regional security," Mean and others warn. To prevent such danger, 15 nongovernmental organizations in Cambodia, Vietnam and Thailand submitted a petition late last month to Huaneng Group, a Chinese state-owned enterprise whose subsidiary holds a large share of the Lower Sesan II Dam project. China's ministries of Commerce, Environmental Protection and Foreign Affairs have also received a copy. This move came shortly after a meeting between Huaneng executives and Cambodian officials in May. During the meeting, Cambodia's Prime Minister Hun Sen reportedly implored the Chinese energy firm to minimize the environmental and social footprint of the Lower Sesan II hydropower project. However, in their petition addressed to Huaneng, the NGOs cited scientific studies saying that the dam buildup would lead to a nearly 10 percent of fish biomass reduction across the Mekong River Basin. They warned that the dam would also contribute to significant changes in hydrological flows, reduce sediment and harm soil fertility. In addition to the environmental risks, approximately 5,000 people, many of whom are ethnic minorities, would be evicted to make way for the dam's reservoir, the statement notes. It adds that when considering those whose livelihoods rely on fishing, farming in floodplains and other activities linked to the Mekong River, the affected population could reach the hundreds of thousands. 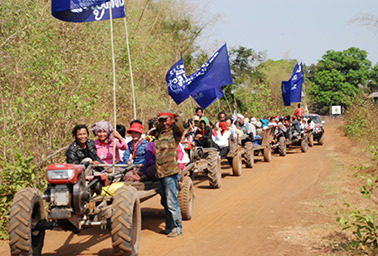 A tractor-riding parade of villagers from northeastern Cambodia protests the construction of the Lower Sesan II Dam there. Photo courtesy of International Rivers. "Despite the severity of the predicted impacts, relatively few people from affected areas have been consulted [for] the project," the NGOs said in their press release. "Many of those who did join consultation meetings reported that they were not given enough information or a chance to voice their concerns at hearing conducted by project developers and Cambodian authorities." According to the NGOs, the project developer also failed to provide assessment of transboundary impacts. Huaneng did not respond to ClimateWire's request for comment. China in recent years increasingly has invested in energy projects in Asia as part of its strategy to go global. However, not all the investments are welcomed by locals. "There is a rising resistance against China-led energy projects in recent years," said Ren Peng, a program coordinator for the Beijing-based Global Environmental Institute who specializes in China's overseas investments. "China has more and more overseas energy projects, and not all the companies are qualified to carry those projects, resulting in a growing number of conflicts," Ren said. "Besides that, there is a demonstration impact of the Myitsone project." The project Ren was referring to was financed and partially built by the China Power Investment Corp. in Myanmar. With a potential of generating 6,000 MW of hydroelectricity, the Myitsone was to be the largest of seven dams at the headwaters of the Irrawaddy River. If completed, it will be the 15th-largest dam in the world. But as soon as construction work on the Myitsone project was started in 2009, it ran into strong local opposition. The Kachin Independence Army broke a 17-year-old ceasefire to attack the dam site. In 2010, a series of bombs exploded around the dam site, injuring at least one Chinese worker..
Beijing is apparently aware of the problem. Last year, Chinese policymakers issued environmental protection guidelines for foreign investment and cooperation, the first of their kind in the nation, in an effort to prevent future conflicts in host countries. 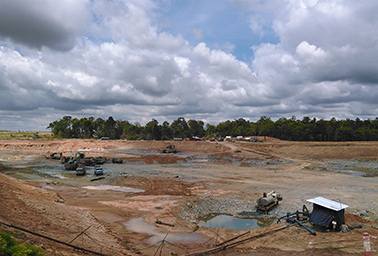 Site-clearing work and other preparations are underway at the Lower Sesan II Dam site. Photo courtesy of EarthRights International. But Mark Poustie, a law professor at the University of Strathclyde in the United Kingdom, doubts how effective those guidelines are. "They are undoubtedly well intentioned and may be useful but they are guidelines and not binding laws," Poustie said in an email interview. "Because of that, they do not contain any accountability mechanisms and it is not possible for Chinese public authorities to enforce them." Poustie's claim was echoed by other experts. Ren said his organization is lobbying the Chinese government to implement more powerful measures, such as blacklisting companies with environmentally harmful practices and blocking them from government loans. Ren declined to comment on the recent disputes over the Cambodian hydropower project due to lack of knowledge of the case, but said that Chinese energy firms he is familiar with have already showed stronger respect toward local interests. For instance, Sinohydro Corp., a Chinese state-owned hydropower engineering and construction company, has included affected communities into decisionmaking during the planning of new projects in Laos. The company has also designated representatives to visit the communities regularly and collect feedback. But Ren acknowledged that there are persistent challenges. For one, many Asian countries are still in the early stages of forming environmental laws, making it difficult for Chinese companies to figure out what to do. Additionally, because most energy projects are conducted by a joint venture between Chinese companies and companies in host countries, even if Chinese companies intend to disclose information, their suggestion may get rejected by local partners. But Maureen Harris, Mekong legal coordinator of EarthRights International, is optimistic about the role that Chinese companies can play. "Without the involvement from Chinese, projects such as the Lower Sesan II Dam would not be able to move ahead," Harris said. "Chinese companies are in a position to use leverage to strengthen the implementation of social and environmental standards for energy projects in countries such as Cambodia." Harris said that they have yet to hear back from the Chinese side about the request to halt plans for the Lower Sesan II dam. She added that more than 75,000 Cambodian villagers threatened by the planned construction of the hydropower project are also waiting for a response from China, after submitting a petition to the Chinese Embassy in December demanding that the embassy intervene against Chinese companies investing in the project. What would the NGOs do if the response never comes? "We want to work more closely with Chinese media and journalists," Harris replied. "The Chinese public hears many stories about the positive impacts of Chinese investment. While there are benefits, there are also downsides of Chinese energy projects. "We want to raise awareness in China, and hope this will help pressure the Chinese companies involved to be more accountable to affected communities and their social and environmental footprint when operating abroad," she said.